Good news for those people who wants to try their hands learning vCloud AirWatch. VMware has released the AirWatch Hands-On-Labs yesterday. 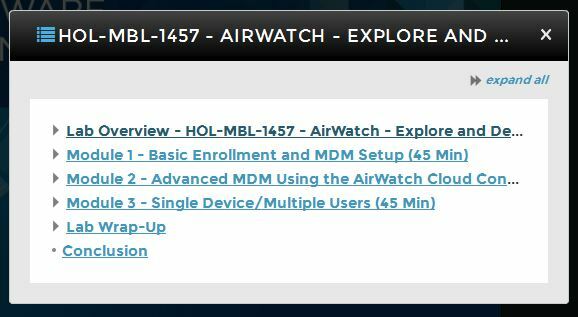 These labs can be accessed by going to AirWatch HOL. The AirWatch labs are designed to give you an introduction to AirWatch and Mobile Device Management (MDM). You can find more information about AirWatch by visiting their website at https://www.air-watch.com. The AirWatch HOL is broken up into three modules that can be done together or independently. Module 1 can be skipped by those who are currently using AirWatch and want to see how easy it is to integrate it with your corporate infrastructure then you can go to Module 2 “Advanced MDM Using the AirWatch Cloud Connector” directly. Module 3 is designed to introduce you to the single device/multiple user concept which has many uses cases including schools, hospitals and more.